Discussion in 'What Breed Or Gender is This?' started by mzrea, Aug 9, 2009. 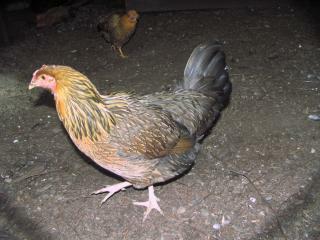 19 weeks old no crowing, Roo? 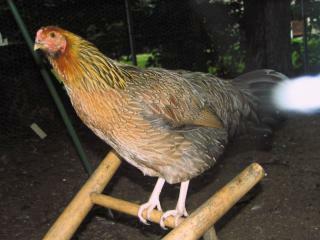 And it looks like it might be a brown leghorn. ? Looks like a pullet to me. There are no pointy saddles on that bird. Hmmm, or maybe a Welsummer, as I don't see any white ear lobes. Those are my guesses. But 100% hen. What makes you think cockerel? 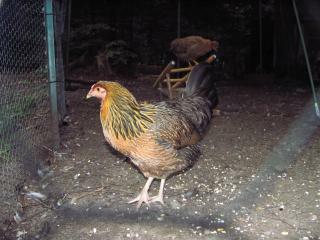 Looks like a cute pullet to me (no pointing saddle or hackle feathers.....).